Fort Meyers, FL – August 2017… New Hope Presbyterian Church (EPC) exists to teach and live the Gospel of Christ and be His Kingdom presence to one another throughout the community. With the recent completion of their new sanctuary, worshippers enjoy a beautiful, inspiring environment. To better ensure their services are engaging and meaningful to all who attend, church management elected to install projection equipment to better convey their message. After careful evaluation, projectors from Rancho Santa Margarita, CA-based Eiki International, Inc. were deployed. 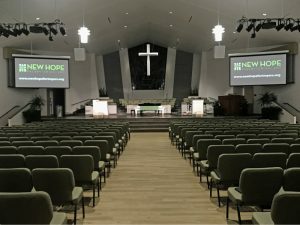 Creative Sound and Lighting Solutions of Cape Coral, FL, an AV installation company that services the house of worship, education, entertainment park, and performance hall markets, was contracted to design the system and deploy the new equipment. After meeting with church management to ascertain their objectives, the team decided to install two Eiki EK-511W LCD projectors for the front and an EK-301W as a rear confidence monitor. Creative Sound co-owner Rob Robinson, who is actively involved in both the company’s sales and installation activities, discussed the project. The setup for the two front EK-511W projectors was no small challenge. These projectors are suspended from the lighting bars over the stage area to visually blend in and not attract attention. The Eiki EK-511W projector offers 7,500 ANSI lumens brightness with 80% uniformity and a 2500:1 contrast ratio, which was crucial to this installation because of ambient light conditions. For the rear confidence projector, the Eiki EK-301W proved an outstanding choice, thanks to its horizontal and vertical corner Keystone correction. To learn more about the services of Creative Sound and Lighting Solutions of Cape Coral, FL, visit the company’s website at www.creativesoundsolution.com or call 888-865-8195.